Always appreciating good quality jewelry with style and elegance I spend a lot of time to detail to create unique, one of a kind pieces. Using high quality stones, semi precious stones, swarovski crystals, fresh water & cultured pearls, pewter, metals, dichroic glass, colourful lamp work beads created by well know artists as well as, many more untique gems from travelling abroad. My newest addition are Kazuri beads from Africa. 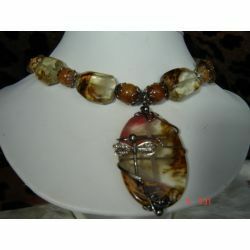 Pendant is 2 1/2 " long & 2" wide. 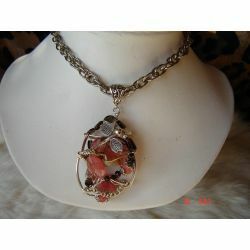 Has a beautiful S.S. Dragon fly on it also pendant is wrapped withS.S. 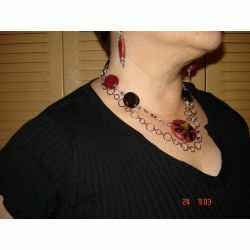 Wire Earrings Are2 1/2 " long, With Cherry Quarts beads. 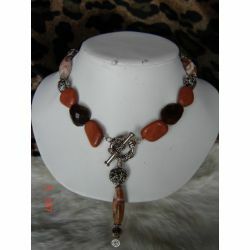 This is a show stopper for sure, It consist of three pieces, Created with Jasper mookite, Red Jasper, Agate & Monaco Agate.Stainless steel beads, Bali S. Silver Clasp & bead, S. silver wire.& silver plate chain. All crimps are covered with crimpcover beads, for a more profesional look. Can wear all together for a layered look or separate for a different theam. Great with burgandy , beige, browns rust. etc.